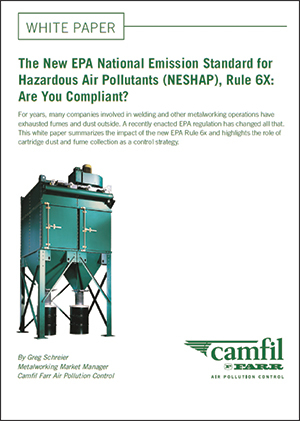 Camfil Farr Air Pollution Control, Jonesboro, AR, has published a white paper focused on proper use of dust-collection apparatus in order to comply with the U.S. EPA National Emission Standard for Hazardous Air Pollutants (NESHAP) Rule 6X. Although the rule went into effect in the summer of 2011, many companies remain unaware of the required actions, according to Camfil representatives. The rule encompasses all manufacturing processes using materials that contain 0.1-percent by weight cadmium, chromium, lead or nickel; or 1.0-percent by weight manganese, which is virtually a universal component of welding wire. Simply stated, there can be no visible emissions (zero opacity) from these processes. • Does Rule 6X apply to your facility? • What are the required monitoring and test methods for compliance? • What types of dust collection equipment can be used? The rule applies to companies who are primarily engaged (defined as 50 percent of more of total labor) in one or more of the following categories: electrical and electronic equipment, finishing, fabricated metal products, fabricated plate work, fabricated structural metal manufacturing, heating equipment (except electric), industrial machinery and equipment finishing, iron and steel forging, primary metal products manufacturing and valve and pipe fittings. Included in the white paper are recommended actions shops can take, including experimenting with different materials and settings to reduce emissions, and employing a dust and fume collector with a well-designed cartridge system that will properly filter welding fumes and other hazardous contaminants. Download the white paper free of charge (with registration) at www.farrapc.com/whitepapers/neshap-6x.